Published: Feb. 22, 2017 at 12:06 p.m. Updated: Feb. 22, 2017 at 02:11 p.m.
Fantasy points can deceive us. Case in point, Terrelle Pryor enjoyed a "breakout" season, posting 77 catches for 1,007 yards as a full-time wide receiver in Cleveland. He had more fantasy points than Demaryius Thomas, Kelvin Benjamin, Dez Bryant, DeAndre Hopkins, and Allen Robinson, who were all far more highly ranked in preseason draft lists. But here's where Pryor missed the mark in fantasy land ... he wasn't a consistent point producer. In fact, he scored around 33 percent of his points in two games. He also lacked what I like to call "explosive" stat lines, finishing in the top 10 weekly scorers in fantasy points at his position twice. It's in those explosive stat lines where fantasy owners earn wins and eventual league championships. So, who were the best players when it came to putting up big totals on a regular basis, and who was more name than numbers? Here's a look at the top 10 players per position who finished in the top 10 most often, along with some interesting notes on a few big-name players who didn't make it. 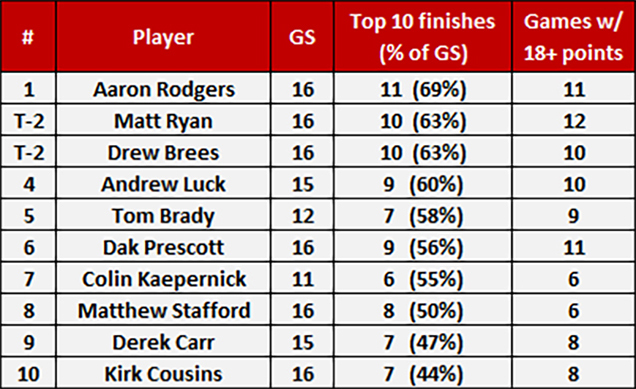 The leading fantasy scorer, Aaron Rodgers was first in top-10 finishes (11) among quarterbacks and games played with two-plus touchdown passes (13). ... No quarterback scored 18-plus fantasy points more times than Matt Ryan (12), which isn't bad when you consider he wasn't even drafted in countless leagues. Losing Kyle Shanahan does put a bit of a damper on his value, but Ryan is still a top-70 overall selection for 2017. ... Drew Brees recorded 10 games with 18-plus points and threw two-plus touchdown passes 11 times. Not bad for the old man, who will be 38 when next season starts. ... Andrew Luck ranked fourth in points, finished in the top 10 nine times and threw two-plus touchdowns in 11 of his 15 games. Now in his prime, Luck is the best young fantasy quarterback in the NFL. He'll be a borderline top-50 pick next season. ... Tom Brady averaged more than 21 fantasy points per game and would have been a top-five finisher had he not been suspended four games. He also scored 18-plus fantasy points in 75 percent of his starts, which is quite a solid total. Even at 40, Brady remains elite. ... Dak Prescott recorded 18-plus fantasy points in 11 of his 16 starts. That's impressive for a rookie signal-caller. ... Colin Kaepernick is the biggest surprise in the top 10, as he posted 18-plus points in six of his 11 starts. Kirk Cousins, who ranked 10th in consistency percentage, had 18-plus fantasy points in half of his starts but finished in the top 10 just 44 percent of the time. ... Ben Roethlisberger also scored 18-plus fantasy points eight times last season, but just three of those performances came on the road. ... Marcus Mariota scored 18-plus fantasy points in seven of his 15 starts, but he was a top-10 quarterback just six times. ... Cam Newton, who was the top-scoring fantasy player in 2015, had just six games with 18-plus points and finished in the top 10 in points among quarterbacks just five times. David Johnson's level of production was ultra impressive, as he finished in the top 10 in fantasy points at his position in almost 70 percent of his games. He also scored 10-plus points 15 times, and his lone absence came when he was injured in Week 17. ... Melvin Gordon, one of the best draft bargains in fantasy football, finished in the top 10 eight times and scored 10-plus points in 10 of his 13 games (77 percent). ... LeSean McCoy and DeMarco Murray tied for second behind Johnson in terms of top-10 finishes with nine apiece. Murray (13) had one more contest with 10-plus points (12) than McCoy, so the two players were very close in terms of their consistent production. ... Ezekiel Elliott, who finished second in fantasy points among backs, tied Johnson for the most games with 10-plus points (15). He was also a top-20 finisher in all but two of his games. ... Le'Veon Bell put up 10-plus fantasy points 11 times, which is impressive when you consider he played in just 12 games. He was also the lone runner to score 40-plus points in a single game. ... Devonta Freeman scored 10-plus points in 10 of his 16 games and was a top-30 back 13 times. ... Latavius Murray recorded 10-plus fantasy points in just seven of his 14 contests and was a top-10 finisher six times (43 percent). Carlos Hyde and DeAngelo Williams tied for 10th with top-10 finishes in 38 percent of their games. The former scored 10-plus fantasy points in eight of his 13 games (61 percent). ... Mark Ingram, who ranked 10th in points among backs, was a top-10 runner just five times and scored 10-plus points in seven of his 16 games. That's not consistent. ... Jordan Howard scored 10-plus fantasy points in 10 of his 15 games (67 percent), which is not a surprise. What is a surprise is that he finished in the top 10 among backs just four times. He did rank in the top 20 a total of 10 times, however, and was a top-30 finisher (flex starter or better) in all but two of his games. Not explosive, but still consistent. ... Jay Ajayi was 11th in points at the position, but he was a top-10 finisher just four times (27 percent) and scored 10-plus fantasy points in six of his 15 games. That's the same of number of top-10 finishes as Matt Forte, Spencer Ware and Jonathan Stewart. ... Lamar Miller, who was 18th among running backs, was a top-10 finisher in 21 percent of his games. Mike Evans and Julio Jones tied for the highest percentage of top-10 finishes, but the former led the position with eight such performances. Evans also produced top 11-20 finishes in two games, making him a solid starter in 62 percent of his games. Jones, who missed two games due to injuries, scored six or fewer fantasy points five times (36 percent). So while he was often times explosive, when he was bad he was very bad. ... Jordy Nelson, the Comeback Player of the Year (and Comeback Fantasy Player of the Year), tied Jones and T.Y. Hilton with seven top-10 finishes and was tied for third in terms of 10-plus point performances (nine). ... Hilton was an all-or-nothing wideout at times, as he was a top-20 wideout eight times but failed to rank in the top 30 in six of his 16 games (37 percent). ... A.J. Green, who missed six games, scored 10-plus fantasy points in 50 percent of his contests. ... Dez Bryant ranked 25th in points among wide receivers, but he was tied with Odell Beckham Jr. in terms of top-10 finishes. Unfortunately, Bryant ranked outside of the top 30 wideouts in six of his 13 games (46 percent). 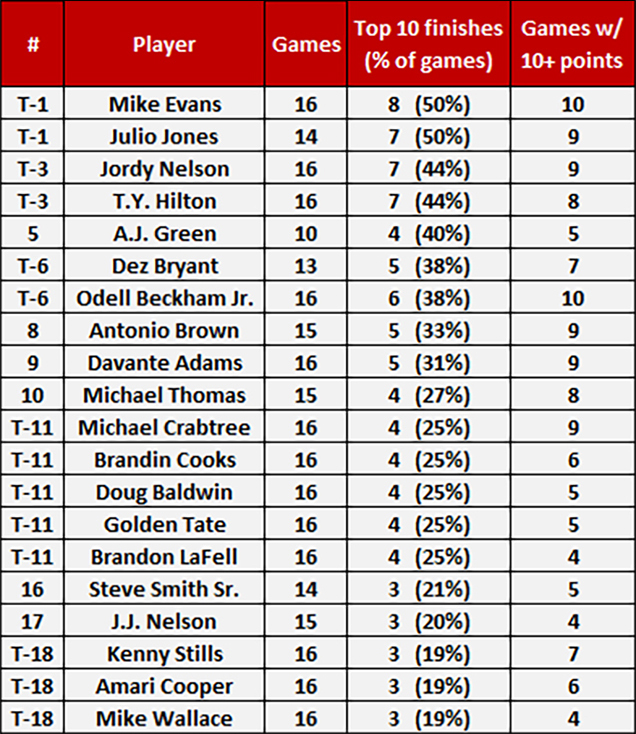 OBJ tied Evans for the most 10-plus point performances at the position (10). ... Brown, who played in 15 games, scored 10-plus points in just 33 percent of his starts. However, he was also a top 11-20 finisher five times and tied Evans, Nelson and Davante Adams for the most top-30 finishes. ... Adams, who was left undrafted in countless fantasy leagues, tied for second in top-10 finishes (nine) among wide receivers. Michael Thomas finished his rookie season with more 10-point performances than Green, Bryant, Brandin Cooks and Doug Baldwin. He was also a top-30 finisher in nine of his 15 games (60 percent). His teammate, Cooks, put up just four top-10 finishes and scored 10-plus points in 37 percent of his games. ... Baldwin and Golden Tate were worse, hitting that mark just five times in their respective 16 games. ... Amari Cooper, who ranked 12th in fantasy points among wideouts, finished in the top 10 three times and ranked outside of the top 30 in 50 percent of his games. That's not a good total. ... In what was a horrendous season for the position overall, former stars like Jarvis Landry, Emmanuel Sanders, Randall Cobb and Brandon Marshall all finished in the top 10 in 19 percent or fewer of their games. ... Demaryius Thomas, Alshon Jeffery, Sammy Watkins and DeAndre Hopkins each had just one top-10 finish at the position last season. One. So, Evans alone doubled the number of such performanes of this quartet of former fantasy superstars. 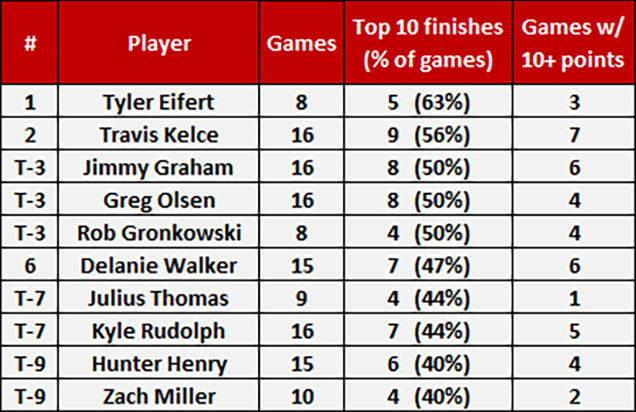 Tyler Eifert was the most consistent tight end based on top-10 finishes, but he missed half the season due to injuries and ranked outside of the top 20 at the position overall. He's an elite option in fantasy land if he can stay out of the trainer's room. ... No tight end had more top-10 finishes last season than Travis Kelce (nine). In fact, he ranked in that stratosphere seven times in his final nine games. ... Jimmy Graham and Greg Olsen both had eight top-10 finishes, but the latter wasn't as explosive overall with just four 10-point efforts. Rob Gronkowski had the same number of performances as Olsen, and he missed eight games. ... Delanie Walker was tied for third among tight ends with seven top-10 finishes, and he was tied for second at the position in terms of top-20 ranks (12). ... Hunter Henry, who shared time with Antonio Gates in San Diego, recorded six top-10 performances and scored 10-plus fantasy points more often than Jordan Reed, Zach Ertz, Gary Barnidge, Jason Witten and Coby Fleener. Cameron Brate, who ranked sixth in fantasy points at the position, was a top-10 finisher five times and was dependent on scoring a touchdown in each of those contests. ... Ertz was a top-10 scorer in just four of his 14 games, all of which came in the final seven weeks of the season. He had ranked no better than 15th over the first nine weeks. ... Reed, who missed four games, scored 10-plus points just three times all season. He also ranked outside of the top 10 in fantasy points among tight ends nine times. So, in standard scoring 10-team leagues, he didn't produce explosive totals in 75 percent of his games.